Each session is the same so you only need to book onto one workshop. To book your place, please complete the on-line booking form below. There are 3 different dates at 3 different venues across Bexley, enabling parents and carers with work/child care and travel commitments to attend one workshop. Bexley Voice parent and carer members who would like to know more about gaining confidence in meeting with professionals. Although the main focus is meetings related to the EHC process and SEND support, the skills are transferable for other meetings. Each session is the same so you only need to book onto one workshop. 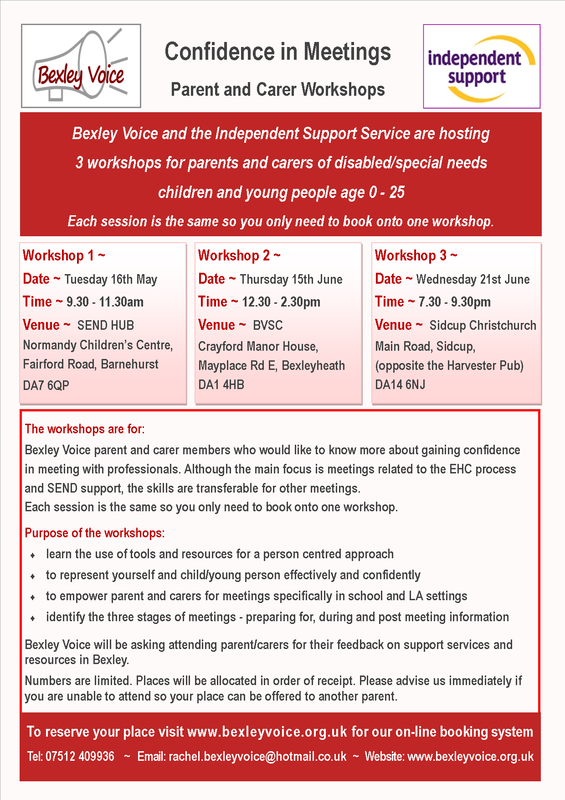 Bexley Voice will be asking attending parent/carers for their feedback on support services and resources in Bexley. Numbers are limited. Places will be allocated in order of receipt. (PLEASE only book if you know you will be able to attend - it is frustrating when parents keep booking our events and do not turn up, thus taking the place of a parent who needs the support. We work hard to get funding to put these workshops on free of charge. If this situation continues to happen, Bexley Voice are considering charging for future events). Please advise us immediately if you are unable to attend so your place can be offered to another parent.